The trade war between the United States and China is receiving a great deal of media coverage and undermining the global business climate. Even so, trade between the two countries represents less than 1% of global GDP, according to IMF data. The decision by the Trump administration to postpone the application of a 25% tariff for three months affects only a tiny piece of the global economic puzzle. 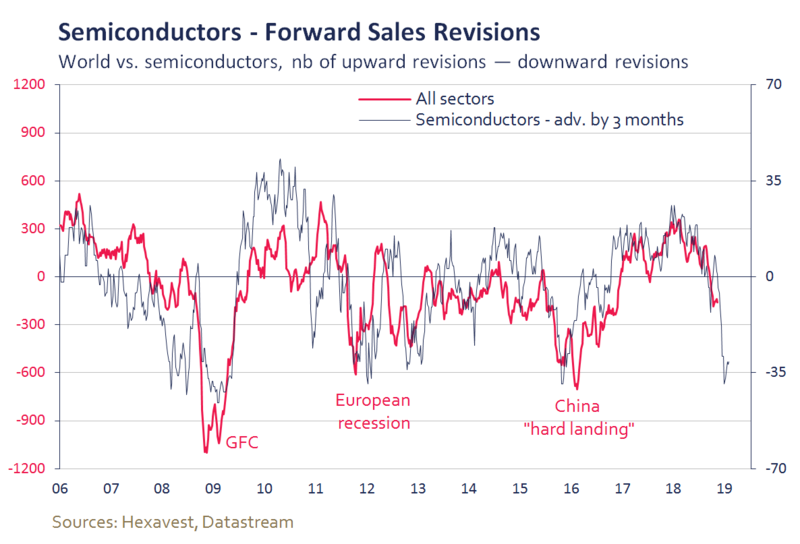 The end of the business cycle, which is far more important for corporate earnings and financial markets, has been shaping the global macroeconomic backdrop in recent months. In the third quarter, the stagnation of the eurozone economy, abrupt slowing of investment in the United States, weak credit growth in China1 and much dimmer prospects for some technology companies confirmed this strong trend. 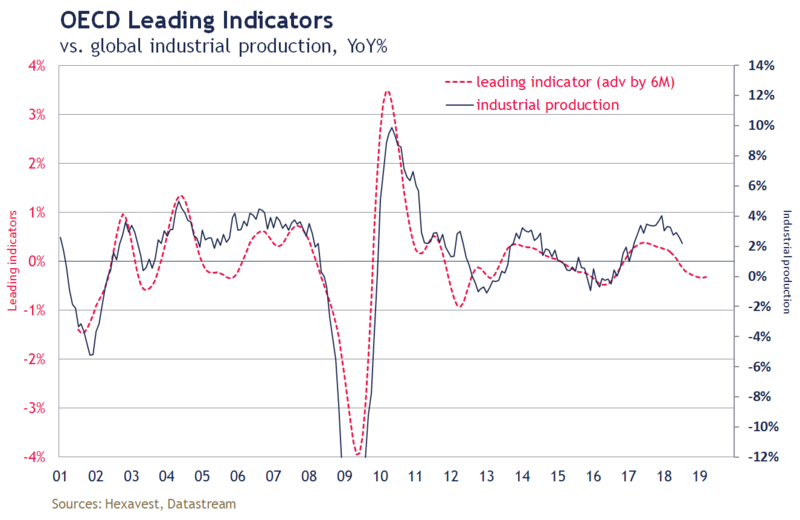 Moreover, the OECD’s composite leading indicator, which provides early signals of global economic activity, suggests that the slowdown will continue into 2019. In our opinion, investors must look beyond the media noise and the sigh of relief that came at the end of the G20 summit, as postponing the U.S. tariffs will not be enough to turn the situation around. For the time being, we maintain a defensive positioning because we think many investors will be surprised when the slowdown is borne out by economic data and earnings announcements at the start of 2019. 1- Sources: Third-quarter GDP according to Eurostat (stagnation of the eurozone economy), third-quarter GDP according to the U.S. Department of Commerce (abrupt slowing of investment in the United States) and the People’s Bank of China (weak credit growth in China). NOTES: The information included in this document is presented for illustrative and discussion purposes only. It is meant to provide an example of Hexavest’s investment management capabilities and should not be construed as investment advice or as a recommendation to purchase or sell securities or to adopt any investment strategy. Any investment views and market opinions expressed are subject to change at any time without notice. This document should not be construed or used as a solicitation or offering of units of any fund or other security in any jurisdiction. The opinions expressed in this document represent the current, good-faith views of Hexavest at the time of publication and are provided for limited purposes, are not definitive investment advice, and should not be relied on as such. The information presented herein has been developed internally and/or obtained from sources believed to be reliable; however, Hexavest does not guarantee the accuracy, adequacy, or completeness of such information. Predictions, opinions, and other information contained herein are subject to change continually and without notice and may no longer be true after the date indicated. Hexavest disclaims responsibility for updating such views, analyses or other information. Different views may be expressed based on different investment styles, objectives, opinions or philosophies. It should not be assumed that any investments in securities, companies, countries, sectors or markets described were or will be profitable. It should not be assumed that any investor will have an investment experience similar to any portfolio characteristics or returns shown. This material may contain statements that are not historical facts (i.e., forward-looking statements). Any forward-looking statements speak only as of the date they are made, and Hexavest assumes no duty to and does not undertake to update forward-looking statements. Forward-looking statements are subject to numerous assumptions, risks, and uncertainties, which change over time. Future results may differ significantly from those stated in forward-looking statements, depending on factors such as changes in securities or financial markets or general economic conditions. Not all of Hexavest’s recommendations have been or will be profitable. Hexavest is a minority-owned subsidiary of Eaton Vance and considered an affiliate of Eaton Vance Management. Investment entails risks and there can be no assurance that Eaton Vance (and its affiliates) will achieve profits or avoid incurring losses.